Candace is a nurse by night, Casual Runner by day, and the rest of the time is the world’s biggest Ohio State Buckeye fan (apologies to Nick, but even he knows that it is true!). Born in Chicago, Candace moved to Indiana before her family settled in central Ohio, which she still calls home to this day. Candace is a big fan of Disney and runDisney, and always looks forward to running those magical miles. You can check out her First Mile store here! This is Part 1 of Candace’s race review and recap, you can now read the fun conclusion to her review here! Who wouldn’t want to run on Las Vegas Boulevard? I remember receiving an e-mail for this race from Rock ’N’ Roll and thinking I absolutely have to do this! I’m a yearly visitor to Vegas and thought might as well turn this year’s visit into a runcation. So I talked a couple of my girlfriends into doing it with me (ya I didn’t have to talk them into it that hard) and instantly began planning our runcation! Seeing as this race was in Las Vegas it was necessary to fly to my destination. Coming off a week at Walt Disney World for the Wine and Dine Half Marathon (AKA the “half/half’) I took a flight directly from Florida to Las Vegas the Thursday before the race. The expo was open to pick up bibs on Thursday, Friday, and Saturday. 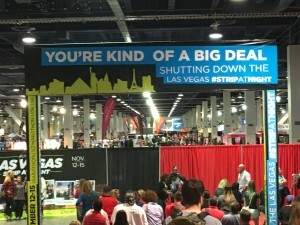 We chose to go to the expo on Friday, once our entire party arrived in Vegas. Now talk about making the runners feel pumped to run this race. 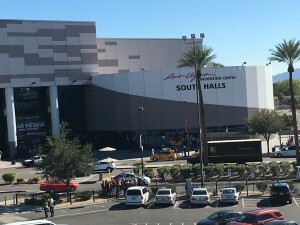 The expo was split up into four sections: bib pick up, t-shirt pick up, official race merchandise presented by Brooks, and the remaining shopping that could be done at the hundreds of vendors. We wasted no time getting our bibs and t-shirts. Then it was onto official race merchandise which to my disbelief was just as crazy as a RunDisney official merchandise expo. There was a lot of awesome swag but I was not about to wait over an hour in line to purchase anything. Brooks was also throwing a party in this area where you could win prizes (similar to what we saw at the Akron Marathon expo) but this time they had a giant Running Shoe that you could ride, imagine a mechanical bull, but a running shoe! It was a really cool attraction but, this being Vegas, one only need to look around at the crowd to realize that after a night on the strip more than a few people were in no condition to ride it. We moved onto walking thru the vendors. There was no designated path on how to navigate your way thru them so we just went row by row. One thing you did have to do in this place was get a wrist band for your post-race drink so that at the finish line the volunteers knew we were 21. 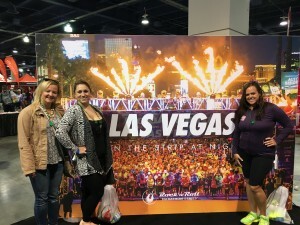 Me and my running buddies ready to the conquer the Strip! One vendor I was excited to go to was New Balance to get reward points like I had the previous weekend at the runDisney expo, but sadly they did not have a check in for this race (so no bonus rewards points for me). We spent about an hour walking around collecting freebies from various vendors and spent some time at the Rock ’N’ Roll booth checking out all of the medals. In addition to the medals at the end of the race, Rock ’N’ Roll also distributes Heavy Medals for running multiple races in their series. These medals were very impressive! The more races you do the medals get bigger and bigger. I swear the one for 11+ races was bigger than my head. This would be my second Rock ’N’ Roll race this year (I had done Washington DC back in March) and this was the first time I had seen the medal I would be getting, but was sadly disappointed to learn that I would not receive it at the finish line, as it would be mailed to me instead. After picking up our bibs we were directed to the t-shirt area where we were given our Brooks neon yellow short sleeved tech shirts. They were given to us in a disposable plastic cinch bag with the Rock ’N’ Roll logo on it. Additional runner perks were available via the wrist band that they gave us. This wristband got us into a free Kid Rock concert before the race, discounts to food and shows, and free happy hours at various clubs. We had great intentions of using these perks, but then time got away from us (as it tends to do when you are in Vegas!) and we never ended up doing anything available to us. My friend Kari posing with me as the Red Queen. I decided to recycle parts of my Red Queen outfit from the 2013 runDisney Tower of Terror 10 Miler at Walt Disney World (a race that is now retired from the runDisney lineup). I felt the Red Queen has a very Vegas vibe seeing as she technically is the Queen of Hearts. 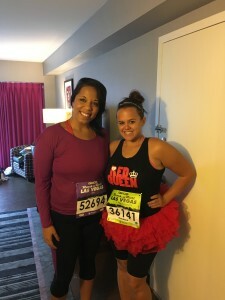 I ended up wearing a Raw Threads Red Queen tank top, a red light up tutu, black compression shorts, my Steigen socks, my Brook’s running shoes. I also decided to go crazy with glow sticks since I was running the Las Vegas strip at night: I had 3 bracelets on each wrist, a necklace, and glow sticks threaded thru my hair and shoes. Looking back now that the race is finished I should’ve went with a long sleeve shirt because I was beyond freezing at the end of the race. The race started at 4:30PM PST and Las Vegas Blvd was not scheduled to be shut down to traffic until 2PM. We spent the pre-race afternoon in Old Vegas and left there at 1:30, so we had to fight traffic to get back to the Flamingo. Once back in the hotel I hurried and changed and was out the door by 2:45PM to meet my friend Jess at her hotel (The Paris). We realized it was going to be impossible to get vehicle transportation (cabs, Uber, anything) to the race, so we followed the race organizer’s instructions to take the monorail to the MGM Grand. We waited for 3 monorails packed full of runners before we could actually board one. Once we arrived at MGM we had a 15 minute walk to the start line. Once we arrived at the starting area there was an option to turn left to go to gear bag drop off, which was also the same location where you either went to get into the Kid Rock concert or to continue straight on to your corral. This was a little chaotic and there was no one explaining where runners should go. Thus, we had to ask other runners waiting in the area for directions. The temperature was quickly dropping and the wind was picking up so we made the decision to take a bathroom break in Mandalay Bay and add lots of glow sticks to our outfits! Around 4:20PM we walked back out to the start line right in time for the National Anthem. Then we had to figure out how to get in our corral. The corrals were barricaded with a white metal barrier that we had to crawl between to get into our corral because we were not about to walk back 15 additional corrals to the entrance and then fight are way thru the mass of people in the corrals to get to ours. While waiting for our corral to start it began drizzling (did I mention the cold and winds as well? 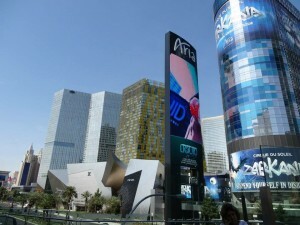 ), and, at 5:17PM we finally crossed the start mat and it was time to conquer the Strip!